See the list below of the current Planning Group (updated November 2018). Click on the name of the organisation to go to the website (opening in a new window). The SOPA Planning Group comprise, in the main, volunteers from Scottish organisations and associations. They have been selected by them to serve as representatives. They give their time generously, and carry forward the work of the annual Assembly. SOPA has good access to government and can raise issues directly with Ministers, in cross-party groups in Parliament and with the Convention of Scottish Local Authorities. Diana Findley was elected as Chairperson at SOPA’s AGM on 26 July 2018. Alan Sidaway is Vice Chair. Born and educated in Angus Diana attended Business College after school During her working life she was a Personal Assistant at director level in three different international companies in England. She also worked in hotel management, and latterly worked with her husband in their own business. On retirement, Diana became involved with Better Government for Older People and was the Chairperson of its Scottish section, the Scottish Older People's Advisory Group. She has served on Age Scotland Board and is currently their Regional Ambassador for the Borders as well as a Trustee of SOPA. 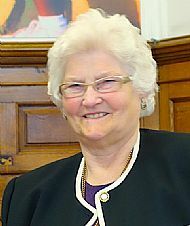 Locally, she is chairperson of Borders Older People's Forum, is on the Borders Board of the Social Enterprise Chamber and attends various other groups relating to older people and their concerns. "I believe it is most important to strengthen the voices of our older people and make these known and understood by those who have the power to make changes and improve lives." SOPA Trustees: Sam Gibson, Bill McDonald, Betty Milton, Alan Sidaway, Alan Spinks, Eileen Wallace, John White, Christine Wilson. Click here to open the SOPA Constitution. This document was agreed by OCSR in April 2016. SOPA is a registered charity (SCO46520).